An exhibition opening this weekend at the Design Museum in London showcases the work of four female designers, including a display of plants for a community garden and an installation exploring the body's circadian cycle. The Design Museum purposely chose an all-female cohort for this year's edition of the annual Designers in Residence programme, in a bid to address the gender imbalance in the UK design industry. Four emerging designers – Hester Buck, Ella Bulley, Legrand Jäger and Helga Schmid – were asked to reflect on the idea of "dwelling" over the course of a seven-month residency at the museum's in-house studios. An exhibition of the four resulting projects opens on 8 December in the studio space where the designers have been working, as part of the museum's Women Design event series. The exhibition opens in the same week that the museum published the results of a survey, conducted by the Office of National Statistics, that found that just one in five designers in the UK are women, as reported by Dezeen earlier this week. The survey found that women make up just 22 per cent of the design workforce, even though seven out of 10 students taking design at A-level are female. "This uptake does not feed through to the design workforce where women continue to remain under-represented," the Design Museum said. 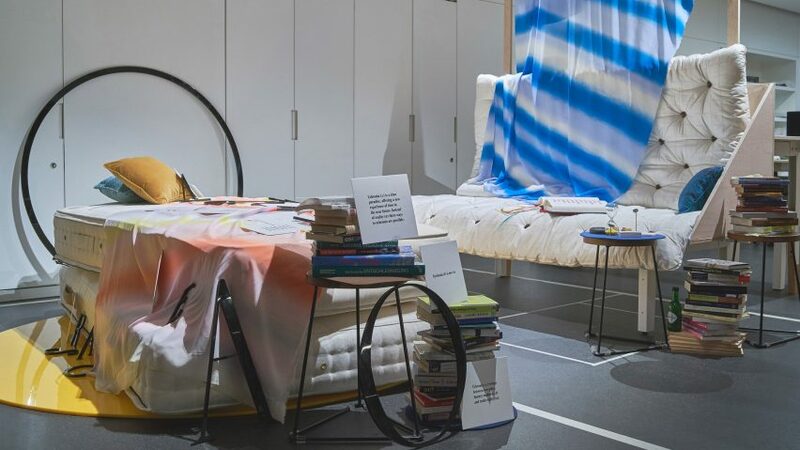 The residents spent seven months researching and compiling information about their chosen topics, looking at smart home devices, social housing, craft and concepts of time through the medium of performance, craft, archiving and planting. For her project, Royal College of Art graduate Buck created an archive of community gardening projects in post-war social housing estates in the UK. Buck installed plants around the museum, which will be transferred next spring to a real community garden. "The archive celebrates the many community gardens that can be found within social housing estates across London. It demonstrates the value of these green spaces and provides evidence to support the creation of new gardens," she said. Elsewhere Berlin-based designer Eva Jäger and her partner Guilemette Legrand, who together head Studio Legrand Jäger, created a voice-controlled smart home device that applies the learning processes used by these devices to study political speeches concerning Brexit. "Our dwellings are becoming virtual, interconnected and hyperlinked spaces, and this digital expansion brings with it massive societal and ethical implications," said the duo. The human circadian rhythm was the central focus of London-based designer Schmid's immersive installation, which invites visitors to lie down in a bed. Coloured lights are shone on the visitor over the course of a 12-minute cycle with each minute representing two hours in the day, to assess the body's reaction to its environment. "The traditional architecture of a home with a kitchen and bedroom becomes irrelevant when the bodily rhythm provides new criteria for dwelling," said Schmid. The final project is by product designer Bulley, who curated a series of objects by Ghanaian expats and repats, to question how the geographical movement of people influences the way objects are designed for the home. "Objects become collectable memories, fusing traditional rituals with the aesthetics and experiences of their new habitat," she said. The museum settled on the theme of dwelling to reflect on how design is reflecting our lives within the home. "More than ever before, our preconceptions of the home are being challenged. In the UK, the rising cost of housing has priced younger generations out of property markets and new technologies are expanding ideas of domesticity," said the Design Museum. "It is clear that our understanding of dwelling, and the home, is shifting. It's no longer about where we live, but about how we live. How can design respond to these challenges and how are our changing perceptions of the home influenced by design?" The exhibition is accompanied by a free publication that presents each designer's research. "To highlight each resident's unique perspective, we have used four fonts that visualise the different themes of their work," said the Design Museum. The exhibition will be on show at the Design Museum in London until 24 March 2019. Previous exhibitions at the museum include one on the late couturier Azzedine Alaïa, whose garments were displayed against custom-made screens by the Bouroullec brothers and Marc Newson, and an exhibition of politically charged graphic design from the last 10 years.